Passengers are welcome to board our ship at 6:00 p.m. After comfortably settling into your cabins, we'll introduce our crew at a welcome cocktail before dinner. We'll start cruising towards Koblenz. We'll cruise through the most romantic areas of the Rhine River. 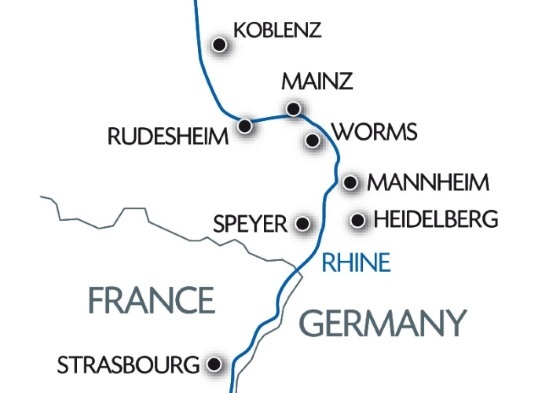 We'll arrive in Koblenz, situated at the junction of the Rhine and Moselle rivers. Tonight is our gala dinner and evening. We'll set out to discover Koblenz with our hostess. We'll then cruise to Rüdesheim. Join us for a tour of the Museum of Mechanical Musical Instruments. Enjoy a traditional evening in a riverside restaurant. We'll cruise towards Mannheim. Join us on an excursion: Guided tour of Heidelberg, situated in the Neckar valley, this town is the mecca of German romanticism. We'll return on board for our New Year's Eve dinner and evening. We'll start cruising to Strasbourg during the night. Enjoy one last buffet breakfast and lunch on board before disembarking at 3:00 p.m. End of our services. Celebrate the New Year in a warm and friendly atmosphere! Cruise the romantic Rhine Valley and discover Koblenz, home to one of Germany's richest heritages, Rüdesheim and its Museum of Mechanical Musical Instruments, and Heidelberg, a symbol of German Romanticism with its fine architecture.